On 13 July 2010 Bruce Galpin reported that a cat had killed a bird with ring AB96364 in Beacon Bay, East London, South Africa. Due to a backlog at SAFRING, this was not processed until this week. The bird had been ringed by me as a Red-headed Quelea at Mt Moreland, north of Durban, 2.5 years earlier (26 Jan 2008), while ringing with Andrew Pickles and others (see trip report). It was ringed as a juvenile that had not started post-juvenile moult. 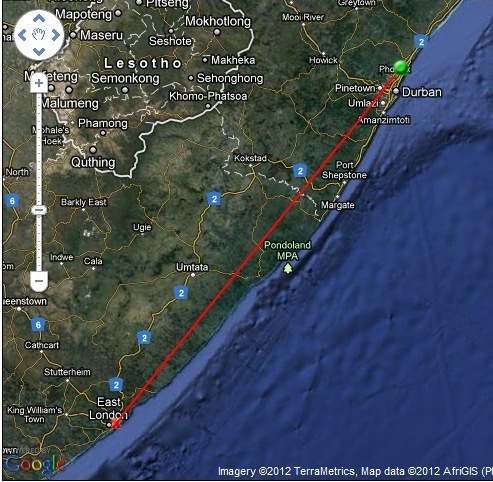 The distance moved was at least 475 km, the greatest distance recorded for the species to date in Africa. 1196 Red-headed Queleas have been ringed with SAFRING rings, producing 3 recoveries and 20 recaptures - the recaptures had moved less than 2 km and the recovery records had distances 54-77 km (rings AB30193, AD00359, and AM28609). This species is migratory but its movements are not well known. The Red-headed Quelea has increased in numbers along the eastern coast of South Africa since about 1980. Sightings of Red-headed Quelea anywhere in southern Africa should be submitted here. A previous news item about this species discussed its plumages.